Place chicken in a large, deep skillet with 1 to 2 tablespoons vegetable oil. Cook over medium high heat until no longer pink. Drain and set aside. Separate crescent roll dough into individual triangles. Place triangles in a single layer on a large baking sheet. In a small bowl, mix 3 teaspoons reserved pineapple juice, honey and ground ginger. 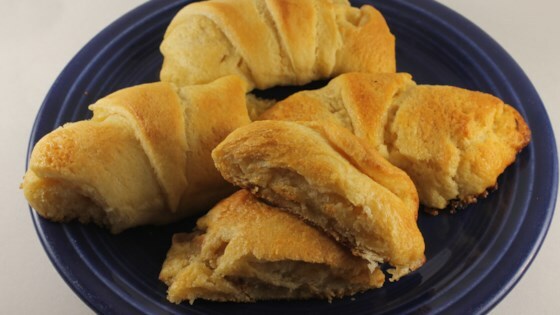 Brush each crescent roll dough triangle with the pineapple juice mixture. Place one pineapple chunk and approximately 1 tablespoon chicken meat on each triangle. Roll and seal each triangle individually. Bake in the preheated oven 15 minutes, or until golden brown. See how to make juicy, tender grilled chicken skewers. Pineapple Chicken Bites were the hit at our party. Try mixing the sauce with the chicken to save time. Enjoy! it needed something to kick it up. the nutmeg was WAY too strong. a good idea, but it needs a little sprucing up! Very tasty, I forgot the ginger and the bites were still great.